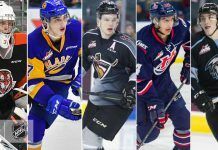 (ISN) – Brandon, Manitoba – Manitoba Liquor & Lotteries, in association with the Brandon Wheat Kings have announced that a 16-year old rookie has been chosen the Western Hockey League club’s IMPACT Player of the Month for January. Brandon’s first pick and fourth overall selection in the 2013 WHL Bantam Draft, Winnipeg’s Nolan Patrick finished second in team scoring last month with fifteen points, including a club leading nine goals. The 6’3″ 192 lb Patrick was instrumental in leading Brandon to an impressive 10-2-0-1 record and 37-9-3-2 overall and first place in the Eastern Conference. In 46 games this season, Patrick has 23 goals and 43 points. Not only is he leading all WHL rookies in goals, he is second only to Brandon’s Ivan Provorov in overall scoring. 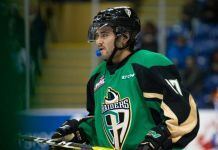 As a member of the Winnipeg AAA Midget Thrashers in 2013-14, the son of former Wheat King Steve had 33 goals and 63 points in 39 games. Patrick joins Rihards Bukarts, Tim McGauley and Jordan Papirny as winners of this year’s monthly honour. This award is presented to the Wheat King who contributes to the team and exemplifies the characteristics of what IMPACT stands for…Inspire, Motivate, Participate, Achieve, Champion and Team. Patrick will be recognized at Brandon’s next home game, scheduled for Friday, February 13th against the visiting Spokane Chiefs.